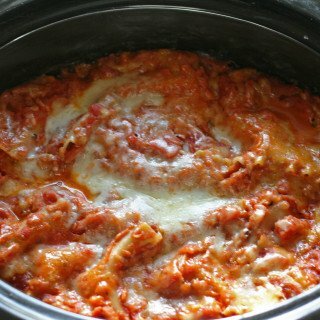 An easy slow cooker lasagna using tofu! A delicious and healthier version of lasagna! My oh my! I have been given a gift from the wonderful people at Houghton Mifflin Harcourt Publishing Company! They have asked me to review some wonderful cookbooks! The fabulous cookbooks are 365 Slow Cooker Suppers, written by Stephanie O’Dea. Stephanie also has a wonderful website, A Year of Slow Cooking! I highly suggest you check out her website for some awesome recipes! Also, You Have It Made, by Ellie Kreiger. I will also be sharing some wonderful recipes from Weight Watchers Family Meals! So we are going to have some yummo recipes for everyone! My family is in slow cooker heaven right now and I will be sharing some wonderful recipes from 365 Slow Cooker Suppers! I am starting with an unbelievably delicious recipe that takes just a few minutes to prepare and the slow cooker does the rest! This really is so tasty and has a great title, Sneaky Tofu Lasagna! It’s sneaky because everyone who eats it thinks you have worked tirelessly to prepare the meal and no one knows there is tofu in the recipe! Once they taste it, they will want it on your regular meal plan! The tofu, they will be hooked, trust me! My girls love tofu, so they were excited for the meal and it did not disappoint! The family requested this meal be made again, and soon! After the second dinner, I told the men there was tofu in it and they were hooked! Could care less it was a meatless lasagna! I love the flavor that the fire roasted tomato brought to the dish. The addition of carrot and zucchini, lets face it, anytime I can sneak veggies in, we all win! This all comes together by combining tofu and the original recipe calls for cottage cheese! I prefer low-fat ricotta cheese and lets not forget the low-fat mozzarella cheese added to the recipe! 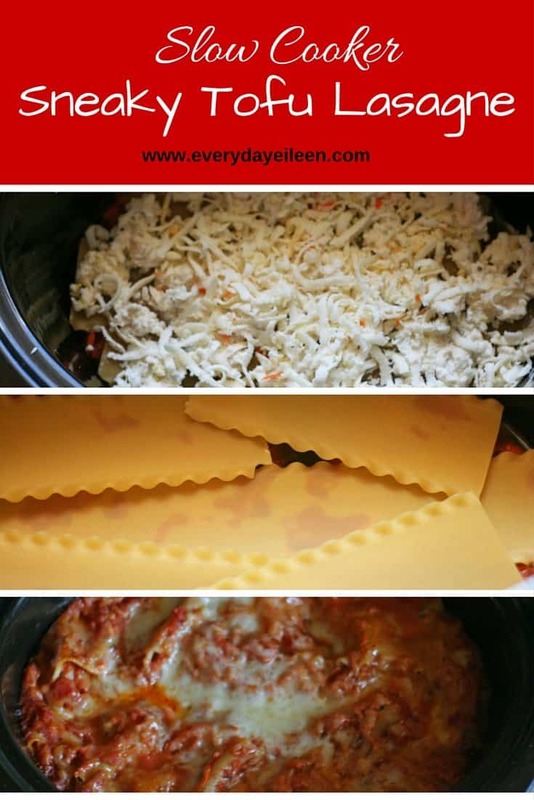 So, the jig is up, family now knows, so do the neighbors and my friends, Slow Cooker Tofu Lasagna is easy to prepare and super delicious! Disclaimer : I was provided the cookbooks to review. All opinions are my own and are not influenced by the sponsor of these books! 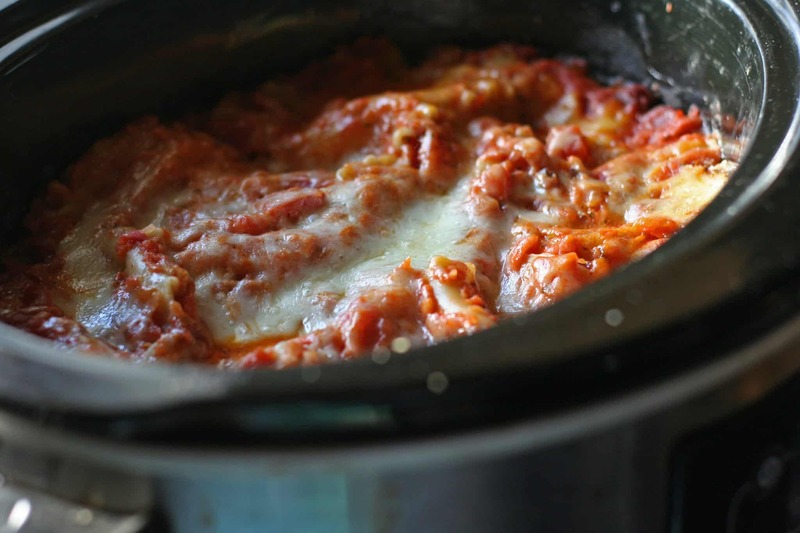 A delicious quick and easy meatless lasagna made in the slow cooker. Using tofu, low-fat ricotta and mozzarella cheese, keeps the calories lower. Using a 6-quart slow cooker. In a large bowl, combine the pasta sauce, fire-roasted tomatoes, shredded zucchini, and shredded carrots. In a separate bowl, combine drained tofu, cottage or low-fat ricotta cheese, Parmesan, and Italian seasoning. To the slow cooker, add some of the sauce. Place a layer of lasagna noodles on top. I break mine to fit into slow cooker. Then add a layer of the tofu- cheese mixture on top of the lasagna noodles. Then add a layer of the shredded low-fat mozzarella. Repeat the layers, until you have used all the ingredients. Put the 1/4 cup of water into the marinara jar, replace top, and shake. Pour the liquid over the top of your uncooked lasagna. Cover, cook on low for 6 to 7 hours, or high for about 4 hours, Uncover, and let cook on high for about 20 minutes, to release any condensation. Cut the tofu into little pieces? I don’t see what to do with it in the instructions. Thank you! I’m making it now. Hey Erica, the tofu is blended into the cheese mixture in step 3. I crumble it into the mixture. I hope you enjoy the recipe. I’d love to hear from you after you make it. Enjoy! Hi there! I just got this started on low, at almost 2 p.m., and wondered if it is truly going to work out ok without burning the noodles if I put the cooker on high? I’d like to have it ready earlier. Hi Jr’s Mom, You can cook this on high for 4 hours without burning the noodles. Let me know how the recipe worked for you. I hope you enjoy! Does the recipe use just regular uncooked lasagna noodles, or the “Oven Ready” kind? Hi Peggy, I use regular uncooked lasagna noodles. The recipe comes out delish! Let me know if you have any other questions and if you make it, I’d love to hear how it went for you. 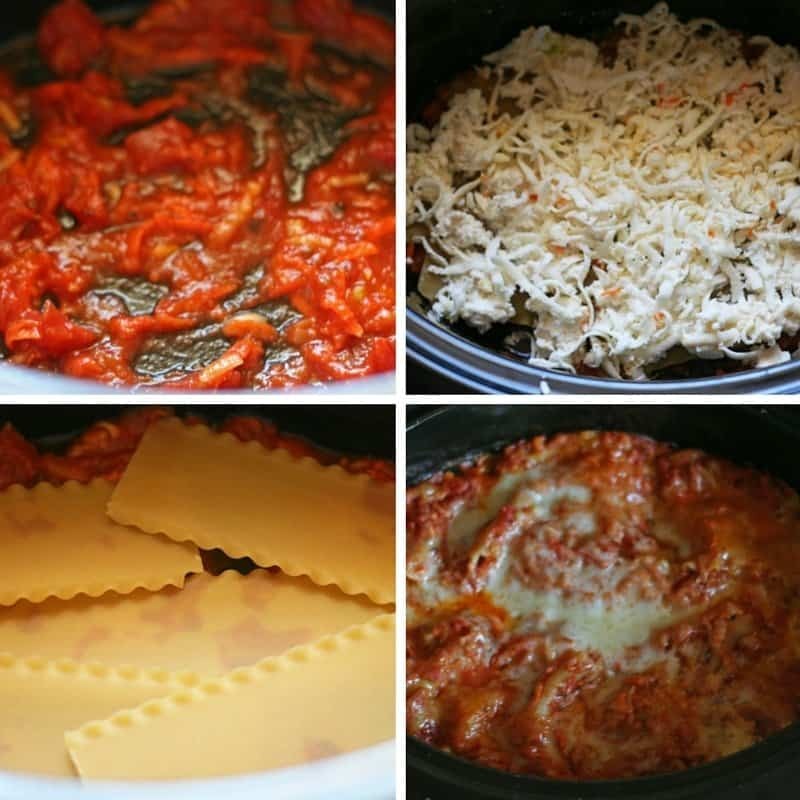 This is a fabulous slow cooker meal. Love using the tofu as my protein. Awesome Cheryl, glad you enjoyed the recipe. It is a good one. Awesome Cheryl, glad you enjoy! Never, ever tried Tofu. I would love to. This recipe looks delicious. Perfect idea for those picky eaters!! I love lasagna too. This looks so good! I’ve never tried tofu, but I think I could stomach in this sort of application, plus I love using my slow cooker. Thanks for sharing! I would never be able to tell just by looking at this dish, that it was made with tofu. I have never had it before…so I am curious about it. This recipe is awesome for two reasons! I love sneaky recipes and feel so accomplished when I can sneak something in on my teenagers! I’m on Weight Watchers now so I love and recipe that is WW friendly! Three of my close friends have recently turned veggie and would love me to love tofu like they do, I just can’t! I reckon in this smaller form I would – I should give this lovely recipe a go! I totally understand and this would be a great one to sample. You will be so surprised by the wonderful flavors. Tofu picks up the flavor of ricotta cheese making this tasty even cheesier! I love the idea of sneaking in some tofu on my family. I’m all about no meat – but my husband and son are like the meat police! We’ve been doing meatless Mondays for a month or so. I am going to try this….we all love tofu and I bet this will please everyone! I can’t wait to check out the 365 Slowcooker recipes…. that would make my life so much easier! Crock pot rules!! This sounds delicious! My husband has a hard time with tofu, so I love meals that let me sneak different things in! Wow does that look yummy. I haven’t cooked with tofu before. This sounds interesting. I am a fan of lasagna so would definitely try this recipe. Yay a veggie meal I can have! I am a vegetarian and love quorn lasagne but have never tried tofu lasagne so this sounds delicious! Ana -my boys are all about meat. So I was overjoyed when they requested this at least 5 times since the first one I made. They did not know at first there was no meat and now they have had chili made with tofu… they loved it all! 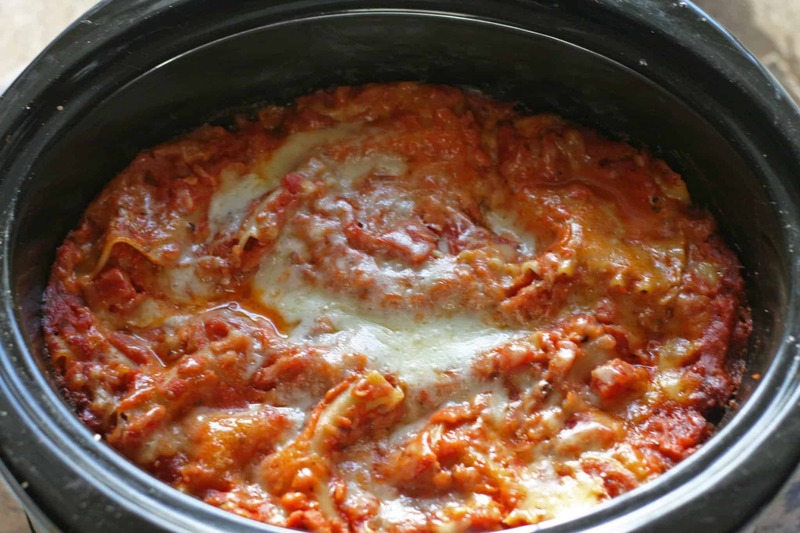 We love lasagna but I’ve never tried it in the slow cooker, let alone with tofu in it. Thanks for the cookbook giveaway, I love getting new slow cooker recipes, I use mine all the time! You are so very welcome. I hope you entered into the contest. I have tried a few pasta recipes and various ways of prepping the pasta. This, by far is my favorite! Ok, this recipe has got my interest peaked! I have heard that tofu takes on the flavour of whatever your cooking so does it have a strong tomato taste to it? ( we have never eaten it before). Pinning this for the weekend. This look really yummy and healthy! I am all about finding “sneaky” ways to eat better! Havent had experience making tofu, but this might be the way I test it out! Thanks! That is a great way to get tofu in there for picky eaters. This sounds like a great recipe.